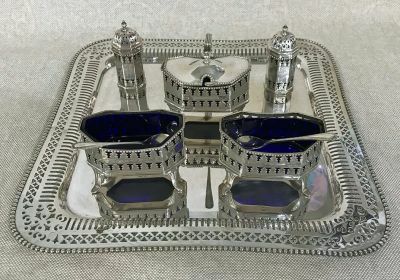 George III style silver plate and cobalt glass 5 piece condiment set. English, circa 1900. The set is comprised of 2 salt cellars with spoons, mustard pot and spoon and 2 pepper pots. The pepper pots are 3” high. The salt cellars are 2” by 3 1/2”, 2 1/2” high. Shown on a square silver plate salver, priced separately. Made by Meriden B., Meriden, CT.